Can NGDP level targeting cure the flu? Over the past week the entire Christensen family has been down with a nasty flu. It has not been great, but it for some reason reminded me about economics. After consulting Google Trends (and seeing Fabebook updates from US Facebook friends) I realized that there is a pretty big flu epidemic on the entire Northern Hemisphere. Just take a look at Google flu trends. In the US the U.S. Centers for Disease Control and Prevention on Friday said that flu had reached epidemic proportions. I am certainly no flu expert, but judging what I have just been through and from talking to friends and colleagues this is a pretty nasty flu causing people to feel sick for as much as 5-10 days. Obviously we have flu season every year, but this one seems to be especially nasty so you don’t have to be an economic (or medical) genius to realize that that could negatively impact economic activity across the entire Northern Hemisphere. The “flu shock” pushes the AS curve to the left. 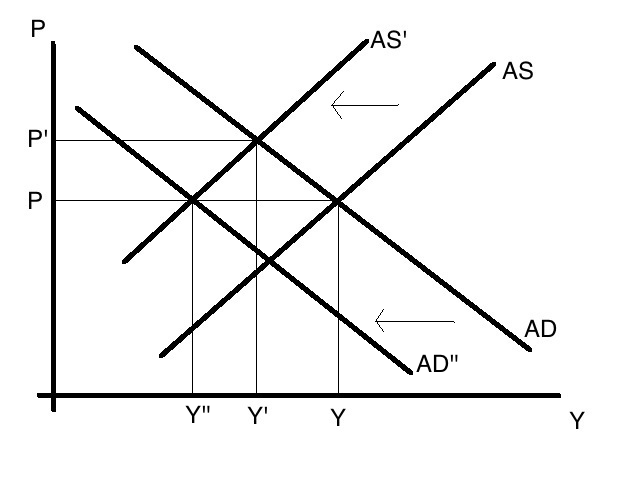 This lead to a drop in production (real GDP) to Y’ from Y and at the same time pushes up prices from P to P’. This is the cost of flu shock – lower production and higher prices. This pretty well illustrates the primary difference between inflation targeting (or price level targeting) and NGDP level targeting. In the case of NGDP level targeting the central bank will keep the NGDP level constant (or at a constant growth path) – hence try to keep P*Y constant. 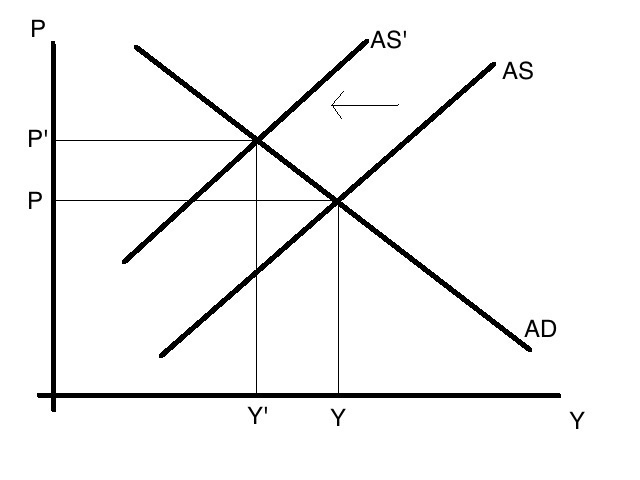 As I have drawn the graph the size of P*Y more or less is the same size as P’*Y’ in this scenario so the central bank will just keep AD unchanged. Said in another way since the central bank cannot cure the flu (supply shocks) it will not try. But at least that will (hopefully) not kill you. This is the doctor treating the flu (a negative supply) with pneumonia (a negative demand shock). So if the flu will not kill the patient there is a good chance the pneumonia will. So if Northern Hemisphere economic data starts to deteriorate in the coming weeks and inflation indicators start to inch up at the same time – then please ignore the “German doctor” if he prescribes pneumonia to cure your flu. Not ignoring him might kill you.